Background: The gut microbes have a close symbiotic relationship with their host. Interactions between host and the microbiota affect the nutritional, immunological, and physiological status of the host. The Aryl Hydrocarbon Receptor (AHR) is a ligand activated transcription factor that mediates the toxicity of xenobiotics. Recently, the relationship between the gut microbiota and AHR has attracted the attention of many researchers. Methods: We undertook a structured search of bibliographic databases for peer-reviewed research literature. Results: We found and reviewed 49 peer-reviewed papers dealing with the major aspects related to the crosstalk between AHR and microbiota. The AHR influences the intestinal microbiota population and mediates host-microbe homeostasis. Interestingly, the gut microbiota also produces ligands of AHR from bacterial metabolism and thereby activates the AHR signaling pathway. Concusion: This review presents current knowledge of the cross-regulatory circuit between the AHR and intestinal microbiota. The findings of this review confirm the importance of AHR-microbiota interactions in health and disease. 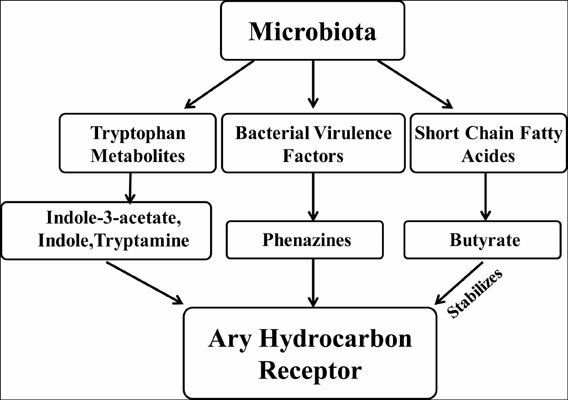 Aryl hydrocarbon receptor (AHR), ligand, xenobiotics, microbiota, cross-regulatory, homeostasis.